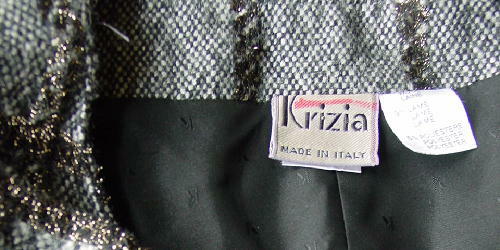 This vintage Krizia jacket is 86% wool, 9% lame, and 5% polyester, and was made in Italy. The nice black lining is 100% polyester doublure and has tone-on-tone K's all over. It has a background in black and white with vertical and horizontal elevated lines with a black base and gold metallic thread. 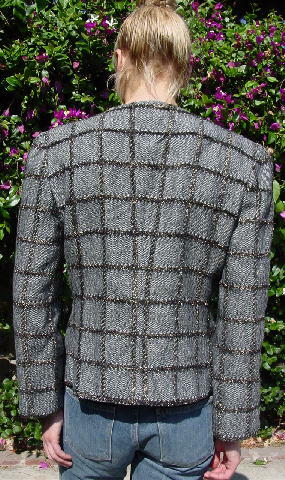 There is a collarless neckline with a mini V front, shoulder pads, and long sleeves with 2 buttons on each. 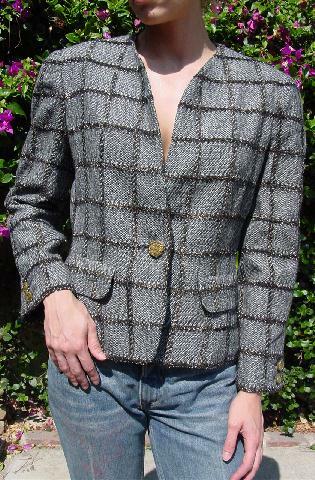 It has two lower flap pockets (still sewn shut) and a one button front. 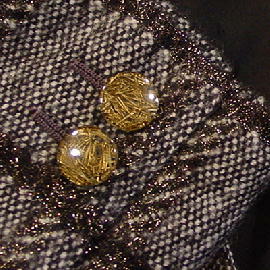 The buttons are all clear with thin gold-tone pieces scattered across the surface - it's quite striking. A model sold it because she needed money. shoulder to shoulder 16 1/2"
shoulder pad to shoulder pad 20"
shoulder to hem 22 1/2"